Constructing Quadrilaterals :To construct a quadrilateral, one should know the properties of it .It is constructed using 4 straight sides. Construction of quadrilaterals can be categorized by the length of its sides and the size of its angles. The quadrilateral family includes squares, rectangles, rhombuses, parallelograms, trapezoid( trapezium), kites and other less regular shapes . Constructing quadrilaterals can be done through 4 ways. 1)	When 4 sides and one diagonal are given. 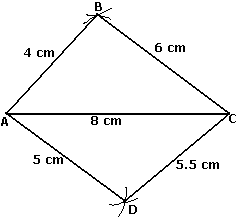 Construct the quadrilateral ABCD with AB = 4 cm, BC = 6 cm, CD = 5.5 cm, AD= 5 cm and AC = 8 cm. Step 2: With 4 cm as radius from A draw an arc. Step 3: With 6 cm as radius cut the arc drawn in step 2. Let that point of intersection be B. Join AB and CB. Step 4: With 5 cm as radius from A draw an arc to the opposite side of AC. Step 5: From C take 5.5 cm as radius and cut the arc drawn in step 4. Let the point of intersection be D. Join AD and CD. ABCD is the required quadrilateral. Construct the quadrilateral PQRS in which PQ = 4 cm, QR = 3 cm, PS = 2.5 cm, PR = 4.5 cm and QS = 4 cm. Step 1: Draw a line segment PQ = 4 cm. Step 2: With 4.5 cm from P draw an arc. Step 3: From Q take radius 3 cm and cut the arc drawn in step 2. Let the point of intersection be R.
Step 4: Take 2.5 cm from P and draw an arc. Step 5: Take 4 cm from Q and cut the arc drawn in step 4. Let the point of intersection of arcs be S.
PQRS is the required quadrilateral. 3) Constructing quadrilateral when its 4 sides and one angle are given. Construct a trapezoid ABCD in which AB || CD, AB = 8 cm, BC = 6.0 cm and CD = 4 cm and ∠B = 60°. In a trapezoid, ABCD, AB || DC. Step 1 : Draw AB = 8cm. Step 2 : At B, draw ∠ABX = 60°. Step 3 : From ray BX, cut off BC = 6 cm. Step 5 : From ray CY, cut off CD = 4 cm. Step 6 : Join D to A. Step 7 : ABCD is the required trapezoid. Construct the quadrilateral TRUE in which TR = 3.5 cm, RU = 3 cm, UE = 4 cm, ∠R = 75° and ∠U =120°. 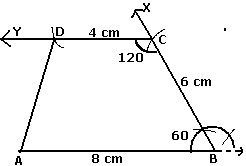 Step 1: Draw a line segment RU of 3 cm and an angle of 120º at point U. As vertex E is 4 cm away from vertex U, cut a line segment UE of 4 cm from this ray. Step 2: Draw an angle of 75º at point R. As vertex T is 3.5 cm away from vertex R, cut a line segment RT of 3.5 cm from this ray. Step 3: Join T to E.
TRUE is the required quadrilateral.